Lung cancer is a worldwide problem. In the United States, less than 15% of people presenting with lung cancer survive 5 yr. Early-stage lung cancer (Stage I and II) is curable with surgery. Unfortunately, the majority of patients present with locoregionally advanced (Stage III) or metastatic (Stage IV) lung cancer, which is seldom curable with surgery alone. 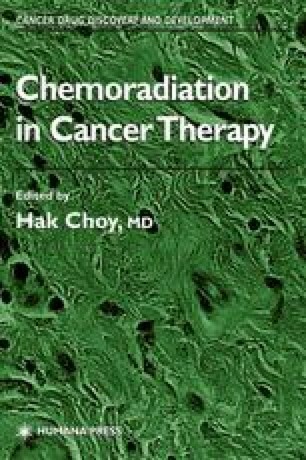 Multimodality approaches with conventional therapies have been developed combining surgery, chemotherapy, and radiation therapy to improve survival. Unfortunately, despite these strategies, the 3-yr survival rates for patients with Stage III disease are still only 20% dropping to less than 5% for Stage IV patients. Additionally, many of the lung cancer patients now in treatment have failed currently available multimodality strategies, often because their tumors have proven remarkably resistant to the effects of radiation or chemotherapy. Although some progress has been made in combining conventional therapies, the increased toxicity is often unacceptable and median survival of nonsmall-cell lung cancer (NSCLC) patients has not markedly improved (1). The identification of novel, less toxic cancer therapy strategies is therefore critical to improve on current treatment strategies, and it is becoming increasingly clear that rational development of these new therapies will depend on our understanding of the molecular biology of tumors.